Hannibal figures in Real Men of Genius as a supreme strategist and master of cavalry. He believed that whenever possible the enemy should be outflanked and not attacked directly. Famous for his ambushes and crafty battle plans, Hannibal was known as a cunning trickster and did whatever was expedient in the circumstances. 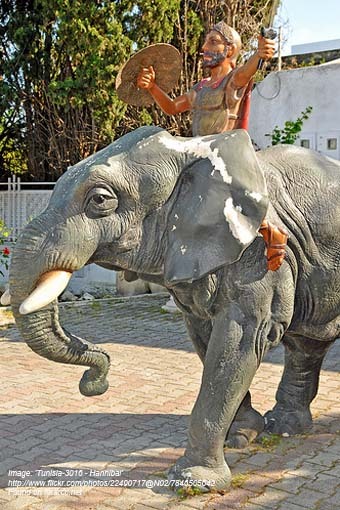 Realising that a sea attack against the Romans was highly risky, together with an army and elephants, he performed the amazing feat of travelling from Carthage and crossing the Alps in a 15-day period. 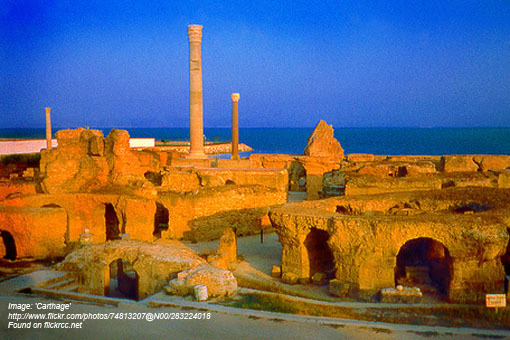 Hannibal, you were born in in Carthage in 247 BC shortly after your father left for Sicily. Tell us about your education? I had a sound education which included Greek and I was enthusiastic about literature. My father taught me about war. It was from him that I learned to be a professional. He was a great soldier and a master tactician. I was a sound athlete. You should remember that at this time the first Punic war with the Romans was over and, even as a child, I swore never to be their friend. There came a time after the deaths of both your father and brother-in-law who succeeded him, that you were proclaimed commander-in-chief of the army. Within two years you launched an attack on Saguntum, which you knew to be under Rome’s protection? Rome was aware of the growing strength of my army and claimed Saguntum as a protectorate which was a clear breach of the earlier treaty between us. That being so, I laid siege to the city and took it in due course. The government backed me and war was declared with Rome. My objective then was to invade Italy. The Romans had 700,000 infantry and 700 cavalry. I could chose to invade from the sea, which would have been the quickest way, but our naval power was not strong. Furthermore, we had no bases in Sicily. Rome, again, had superior strength at sea, so that also was far too risky. The only alternative was to invade Gaul and cross the Alps. Despite the tough conditions, you managed a succession of victories against the Romans? By the time we reached the summit of the Alps, many of my men were frostbitten, but I pointed out the direction of Rome and inspired confidence. I think the Roman, Florus, paid you a fitting tribute? He compared me and my army to a thunderbolt which burst its way through the midst of the Alps and swooped down upon Italy from those snows of fabulous heights like a missile hurled from the skies. So you took them completely by surprise? It was absolutely unexpected. I was also able to detach tribes who had pledged allegiance to the Romans. After winning a large scale skirmish, I was camped on the west bank of the Trebbia close to its confluence with the Po. The Romans were on the east bank. They were up for a battle but I lured them into a trap on open ground between our two camps. The day before battle I picked forces of 1,000 infantry and 1,000 cavalry and under cover of darkness put them into an ambush position where they were hidden from the Romans’ view. The Roman army consisted of about 40,000 including cavalry. Although I had crossed the Alps with 20,000, we had picked up 14,000 Gauls on the way, and we had about 30 surviving elephants. In the early morning we engaged the Romans in skirmishes which encouraged them to attack prematurely by sending their cavalry out, crossing the ice-cold river. They were soon disadvantaged. At that point I let my cavalry loose. As soon as they realised they were trapped, the Romans retreated to the river. Then we attacked with more troops and elephants. It was at that point that we sprung the ambush and attacked from the rear. Many of them fled. The Roman army suffered heavy losses. Unfortunately, we also suffered losses including most of the elephants in the cold weather that followed. All this was not without personal injury? Whilst travelling through the wetlands around the river Arno, I lost the sight of one of my eyes. But we had another great victory at Lake Trasimene the following year. The consul, Flaminius, commanded around 25,000 men. I brought my men into a nearby area in full view, knowing that Flaminius would feel the need to attack us. The setting was rather like an amphitheatre. I hid troops behind the crest of the hills on the left and between the folds of the ground. My cavalry were near the entrance ready to block it once the Romans had entered. I placed others on a ridge blocking the exit. Flaminius attacked at dawn only to see the rest of my army charging downhill at them. They could not effectively resist. We destroyed many thousands of Romans including the consul. You also outgeneralled the Romans at Cannae in the same year. To put it shortly, the Romans again tried to fight their way through our Punic line relying on their sheer mass of numbers. They had something like 80,000 infantry and over 7,000 cavalry. I had the good fortune to command around 40,000 infantry and 10,000 cavalry. By now we had the assistance of equipment we had captured in earlier battles. I used my cavalry to attack head on and then cut from behind to attack their rear. As they pushed back, I attacked from the flanks and the result for the Romans was utter carnage. Almost 50,000 Romans were slain. A number of senior Roman army officers and 80 senators were included in the dead. I believe they were the highest casualties suffered by the Romans. Finally, in 202 BC, 14 years after this rout, the Romans gained their revenge and you were defeated at Zama? The war in Italy became something of a stalemate. The Romans used guerrilla tactics and we lost several important battles although we did win others. I was recalled to Carthage and I was defeated by Scipio who used many of my own tactics against me. And after the battles were over you became a statesman to add to your reputation as a great general, tactician and leader of men. I was able to see that the constitution was revised so that there were annual elections and restrictions placed on the length that individuals could hold office. I eradicated corruption, collected unpaid taxes and in that way kept tax down. But a few years later you went into exile? Yes, the Romans did not like the prosperity in Carthage and desired my surrender. After assisting Antiochus of Syria against the Romans, I eventually went off to Crete. The Romans continued to hunt me. I assisted Prusias of Bithynia but when he was defeated the Romans demanded that I be given up. By then I was 64 years old, and rather than fall into Roman hands I took poison and ended it all. I had been a thorn in the Romans side for very many years and I am sure there was a huge sigh of relief when they knew I had gone.